Delta export pumping has increased, jeopardizing endangered Winter Run salmon and Delta smelt. Yes, there is a lot of fresh water (and young salmon) pouring into and through the Delta from the recent storms. 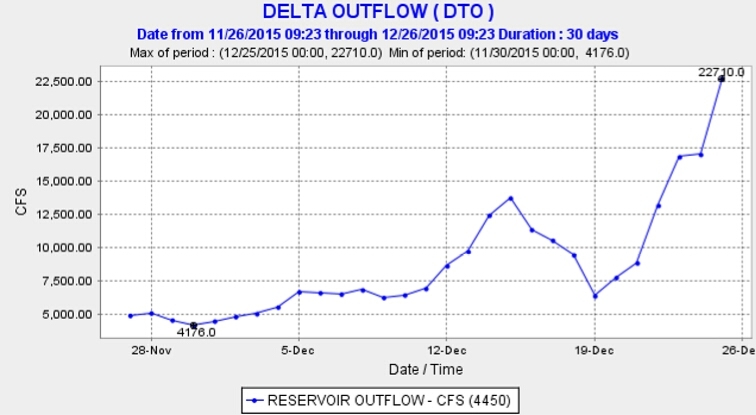 Delta outflow has risen from 5000 cfs to 22,700 cfs this month (Figure 1). So the state has started pumping more from the south Delta. State exports have risen from 500 cfs on 12/21 to 4000 on 12/23. The problem is that the Low Salinity Zone (LSZ, 500-10,000 EC1) so critical to the Delta ecology has yet to be flushed west, out of the Delta. Turning up the pumps has actually increased the concentration of salt in export water (Figure 2) by pulling LSZ water from the north and west into the central and south Delta (Figure 3). Smelt and salmon concentrate in this zone. The LSZ has moved west from Rio Vista in the north Delta on the Sacramento River (Figure 4), but not from the west and central Delta on the San Joaquin side (Figure 5). Export pumps in the south Delta are pulling LSZ waters from the San Joaquin channel through False River and Dutch Slough (Figure 6). Figure 1. 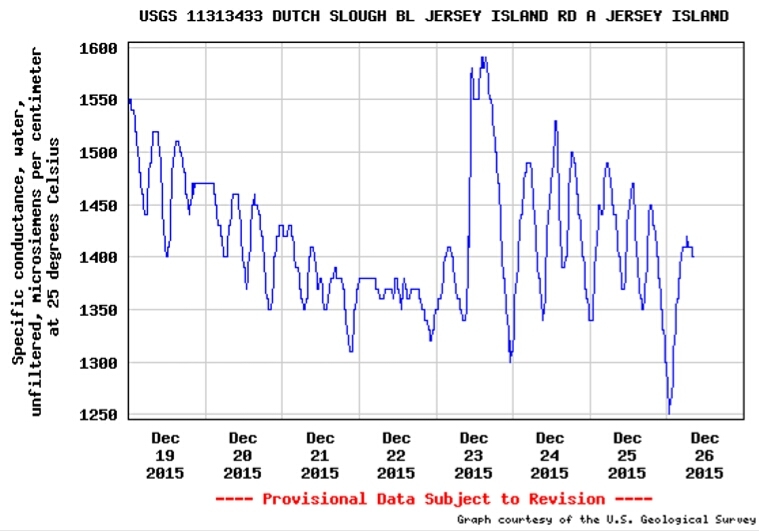 Delta outflow in December 2015. Figure 2. EC of water exported from Clifton Court Forebay in south Delta in December 2015. Figure 3. 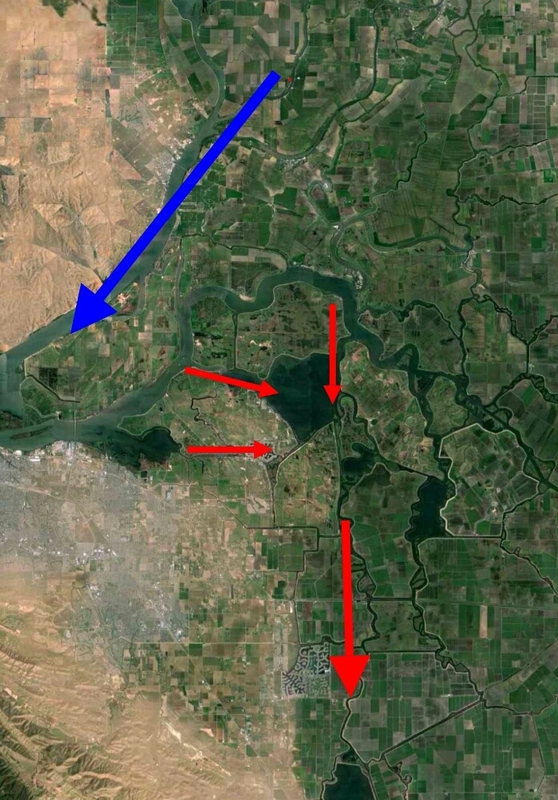 Aerial photo of Delta showing high Delta freshwater inflow and outflow from Sacramento River (blue arrow) and South Delta exports pulling brackish Low Salinity Zone water from central and west Delta San Joaquin channel to south Delta export pumps at Clifton Court Forebay (center bottom). The two eastward red arrows represent the False River (upper arrow) and Dutch Slough connections. Figure 4. 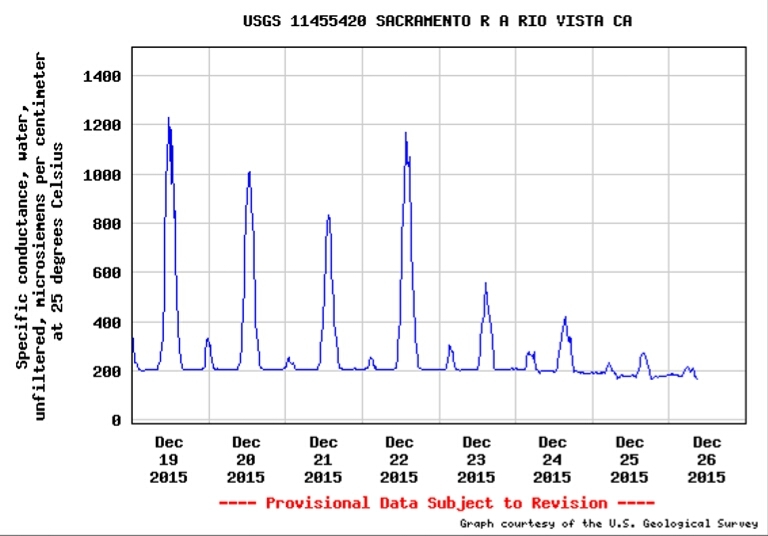 EC at Rio Vista in north Delta on Sacramento River 12/19-12/26, 2015. Figure 5. 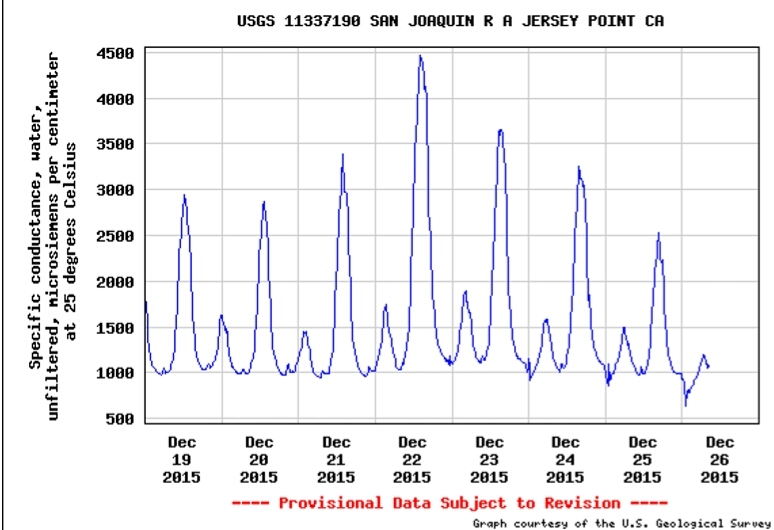 EC at Jersey Point in the western Delta on San Joaquin River 12/19-12/26, 2015. Figure 6. 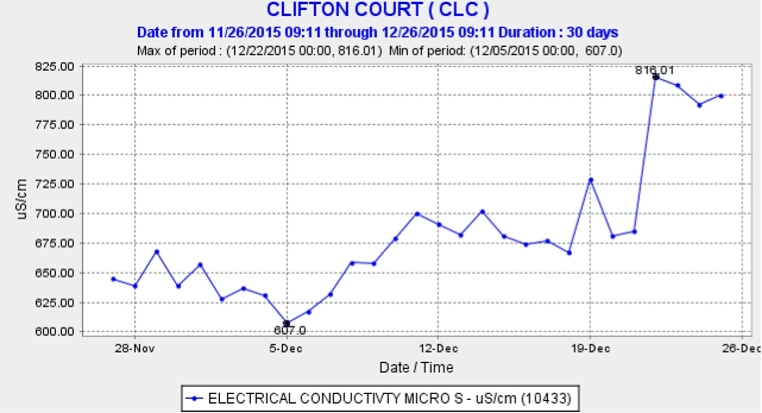 EC at Dutch Slough between the west and central Delta 12/19-12/26 2015. Note spike on 12/23 when south Delta exports were increased to 4000 cfs. This entry was posted in Bay-Delta, Water Quality by Tom Cannon. Bookmark the permalink.